One of the most common challenges facing families today is how to communicate feelings in ways that help instead of hurt. Effective techniques are available, so it’s just a matter of learning these tools and putting them into practice. Whether it’s anger, hurt, fear, sadness, or guilt, research tells us that feelings want to come out. 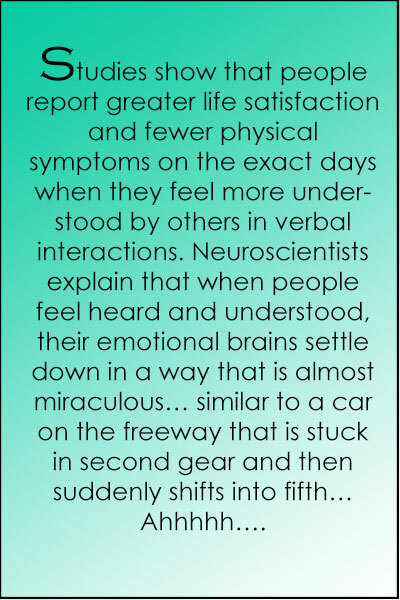 Feelings held too long inside can result in withdrawal, depression, anxiety, low self-esteem and a whole rash of psychosomatic problems such as headaches, stomach aches, and difficulty sleeping. On the other hand, expressing feelings in hurtful ways such as with put-downs, meltdowns, sarcasm, withdrawal, or behavioral acting out can create great strains on our relationships. 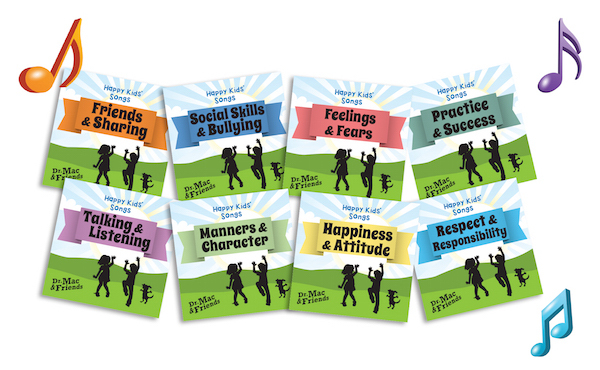 There are at least five main ways that our children learn how to communicate: from the model of adults in the family interacting with one another, from the way that the adults communicate directly with them, from their relationships with brothers or sisters, from examples on TV and movies, and from how they interact with their peers. Alex and Avery were eight-year-old twins referred for school problems. From an initial interview with the family, it was learned that Alex had gotten suspended from school for hitting. Avery suffered from social isolation and complained of having only one friend, adding that lots of kids teased her. Asked whether her twin brother ever took her side when she was being teased, Avery exclaimed, “We don’t get along.” The rest of the family nodded in agreement, confirming that the kids were constantly at each other’s throats. A stone-cold silence entered the room. Bickering between siblings, as with Avery and Alex, is one of the most common symptoms that arise from not having tools for working out feelings. One of our favorite lead-in questions is “Do you guys ever recycle or do you throw everything in the trash?” We’ll get affirmative answers around re-cycling things like bottles, cans and newspapers, and then follow up with “That’s great, but do you know how to recycle your relationship when things get strained?” The point of the question becomes obvious. 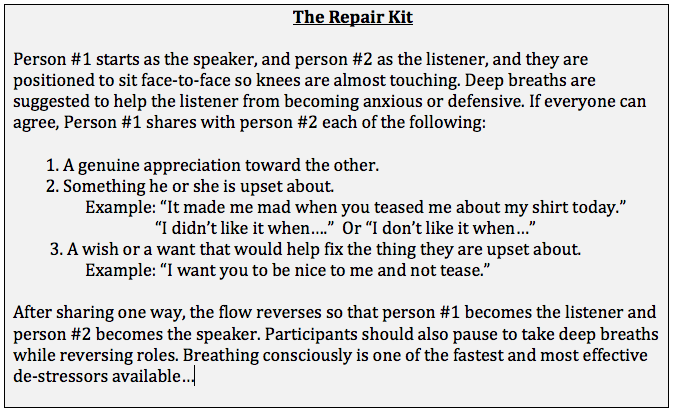 One of the conflict-resolution tools that we teach parents and kids is called “The Repair Kit.” It can provide an effective path toward forgiveness, conflict resolution, and bringing out the best in one another. Once acquired, this method can be used as frequently as needed to help things run more smoothly. If you’re thinking that you and your partner may need to do a few couple’s tune-ups with this process first, don’t be embarrassed! That’s often the case, and you can use the exact same model. We’ve taught it to thousands of couples as well. After listening to the song and learning how to use the “repair kit”, Alex and Avery’s relationship improved dramatically. They talked to each other about things that had hurt each other’s feelings and made some agreements about how they were going to treat each other. Their mom also set up more play dates with peers as an additional way for them to practice their new social skills with some coaching. We can’t overemphasize the importance of healthy communication. In happy, loving families, family members take time to check in and learn how to talk and listen to one another. They know how to repair hurt feelings instead of withdrawing or becoming hurtful to each other. As hard as connecting can be in the hurried pace of our day-to-day lives, quality communication is more important than ever. Don MacMannis, Ph.D. is a psychologist and Clinical Director of the Family Therapy Institute of Santa Barbara. He has specialized in the treatment of children and families for over forty years. “Dr. Mac” is the co-author of two highly acclaimed books: How’s Your Family Really Doing? : 10 Keys to a Happy Loving Family. and Who’s the Boss? The Win-Win Way to Parent Your Defiant Strong-Willed Child. Also specializing in creative projects for young children, he was music director and songwriter for the PBS hit series, Jay Jay the Jet Plane and has also written for Mutt & Stuff on Nick Jr. Most recently he produced Happy Kids Songs, an award-winning series of over fifty songs and activities for social and emotional learning. Previous Previous post: Why Shop at Songs for Teaching? Next Next post: Reflections from Two of a Kind!